Protection of electrical and electronic equipment against transients originating from lightning or switching sources. Equipments such as computers, printers, or televisions can all be vulnerable to transient overvoltages from lightning and switching surges. These transients can cause damage ranging from the premature ageing of equipment, logic failures and down time, to the complete destruction of equipment within the entire electrical installation. Lightning and switching surges do not only reduce the equipment’s lifespan, they also cause loss of data and can threat people’s lives in case of insulation failures of equipments. Hager SPNxxx range of Surge Protection Devices assists in the protection of people and equipments against transients, originating from lightning and switching sources. All applications are covered - Hager offers type 1, type 2 and fine protection devices. 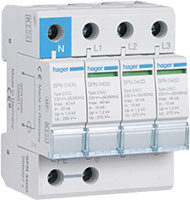 Click here to know more about Hager's Surge protection devices. Download the guide to Surge protection devices (please connect to your account before download).